Ever dream of climbing aboard your home on wheels, settling into the driver's compartment, buckling up and heading off to experience the vast panorama in a smooth, relaxing, enjoyable driving environment? Tackling the curves as you would with an equally priced, specialty race coupe, with a latte in one hand while the other effortlessly caresses the steering wheel and guides your steed blithely through the twists and turns on endless ribbons of concrete? Or are you like many RVers who are forced to literally maintain a white-knuckled death grip on the wheel with both hands, fighting a mere 5 mph side breeze, constantly correcting the steering wheel, wracking back and forth so violently your holding tanks always read "Full"? Does the strain on your back and neck have you questioning whether you are indeed in your motorhome or on some exotic thrill ride at Wally World? In truth, many, if not most, of today's motorhomes do experience some not-so-pleasant nuances with ride, handling, steering and suspension. Typically, it all relates to weight distribution and methods of counteracting the physics of propelling a motorhome down the road. Thankfully, the aftermarket is rife with products that can and will address those issues as they relate to the specifics of each motorhome. Is that to say your motorhome will gain the uniqueness of that sporty race car? Not quite, but your new vocabulary will include phrases like, "vastly improved," "easier handling characteristics" and "much safer." Plus that pounding headache will go away. 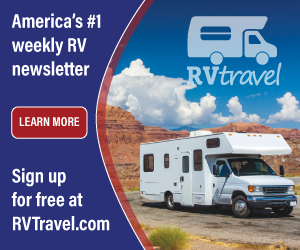 Any discussion among veteran RVers will yield an assortment of concerns which include subjects such as tires, front end wander, rear end sway, rut tracking and that porpoise-like up and down oscillating. And since every coach displays different symptoms based on the design characteristics of that coach, there is no single fix that will fit across the board. What may work on one RV, may not on another. In fact, because each coach is so inimitable and each symptom so specific, specialty shops abound that deal exclusively with improving motorhome ride. If you are an RVer who understands from whence I speak, take heart, for there are solutions. The first thing to investigate during any preemptive troubleshooting foray into ride and handling problems centers on weight distribution. Face it, RVs in general and motorhomes specifically are not created symmetrically nor is the weight equally placed on the chassis. In fact, John Anderson, Founder of the Recreational Vehicle Safety Education Foundation once stated that, "Of all the RVs we've weighed (over 10,000 RVs in the first seven years); we've never come across one that was loaded equally on both sides." It is vital then, that the astute RVer know exactly how much the coach weighs as loaded for travel. In no area is this more important that the motorhome tires. Knowing how much weight each tire location is carrying is virtually the only way to know how much air pressure to pump into each tire. Over or under inflation alone can breed a plethora of steering, handling and safety worries. Additionally, most every tire company will stress the importance of proper tire sizing and load range choice for each gross axle weight rating. As for all other steering, handling or sway issues, always begin by ensuring your rig is set up with the correct front end alignment at factory specs before adding equipment and components. Also, according to Kevin Healy, owner of an RV specialty shop, East County Alignment & Brake, always have the stock springs tested and evaluated prior to slapping on replacement parts. Granted, aftermarket products will indeed improve drivability, but having the correct spring rate is vital to knowing which combination of aftermarket products will do the most good. Since it could be a substantial investment to rectify all ride and handling ills, the smart RVer will seek the biggest bang for the buck. No talk of front end remedies omits the name Bilstein. Simply put, if your coach is not already equipped with Bilstein shocks, get some. This upgrade is the most common aftermarket replacement component in use today. For the larger diesel pusher rigs, it's not uncommon to find four Bilsteins added to the rear end also. More front end improvement is realized with the addition of the Davis TruTrac(tm) Bar. Developed by RV chassis expert Eric Davis, this bar allows for a stricter control of the motorhome with less effort exerted by the driver. The TruTrac(tm) holds firm the contemptible front axle side to side movement that can turn a leisurely RV excursion into a driving nightmare. If front end wander or rut tracking are frequent experiences for you, the TruTrac(tm) Bar is a necessity. To avoid worry over severe tire oscillations on bumpy roads, or loss of control during a front tire blowout or a sudden shudder caused by a passing truck, there are a couple of cures to consider. Steer Safe and Safe-T-Plus are the front runners in the steering damper area. Designed to keep the front wheels between the ditches at all times, either of these two comparable add-ons are on most RVers want list. Coupled with the aforementioned Bilstein shocks and Davis TruTrac(tm), the inclusion of either of these steering stabilizers rounds out the most popular, three-component upgrade package for motorhome front ends today. Though each addresses basically the same steering symptoms, the Safe-T-Plus employs sealed components which could be a factor if you travel in areas where salt, ice and moisture are prevalent. Do you constantly over-steer your motorhome as you travel down the road? The need to continuously wrestle the steering wheel just to stay straight could also be caused by a not-so-pristine steering control mechanism called the bell crank. Thankfully Henderson Line-Up Brake & RV has developed a superlative replacement product, the Super Steer Bell Crank. Many motorhomes built on the older Chevrolet and GM chassis especially are prone to rapid bell crank fatigue due to inferior bearing design. The result was a need for a rebuild or a replacement after just a few thousand miles. The maintenance-free Super Steer Bell Crank uses precision tapered Timken bearings and is completely sealed against road debris and moisture. Ah, but not all ride and handling problems are limited to just the motorhome front end. Rear end sag or sway, the tail wag the dog syndrome, are also problematic for many coach owners. Again the aftermarket proffers up the fixes. Air bags and a heftier rear stabilizer bar will effectively address the sway problem and body roll tendencies of boxy motorhomes. Once again the Henderson brothers bring a solution to the mix with their Super Steer Rear Stabilizer Bar. A larger diameter bar and improved, high-strength polyurethane bushings are all features of most aftermarket rear sway bars. 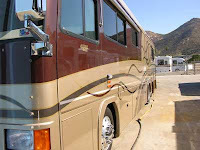 It's seldom argued that virtually every motorhome will ride better with a larger sway bar. Air Lift air bags just may be the solution if your rig is drastically out of balance front to rear. Rear end sag is not only unsightly on people, but likewise on motorhomes. Plus this imbalance reduces the downward force on the front axle, thereby negatively affecting the front end suspension and steering characteristics. The obvious fix is to raise the rear end, shifting some weight forward onto the front axle resulting in better steering and handling up front. Simply adding leaf springs, however, creates a stiffer, less flexing alternative. If your driveway displays the tell-tale gouges in the concrete from the ball mount on your motorhome, or you look like Flipper going down some roads, perhaps it's time to consider a rear air bag system. Do remember there is an Air Lift kit for just about every motorhome. Without a doubt, RV owners of yesteryear never had as many aftermarket opportunities to improve upon ride and handling as do RVers of today; most just suffered in silence, drifting from RV to RV hoping for a better ride at each trade. Thanks to the diligence and ingenuity of some bright minds, there are better mousetraps out there. Indeed today's coaches are better than ever, but with each body size, floor plan design, wheelbase dimension, weight distribution variance, and chassis brand, comes the need for pinpoint troubleshooting to determine which products will offer the best possible solution for common front and rear ride tribulations. Once that is determined, one quick trip to your local RV Service Center will have you sipping that latte in no time while allowing the blood to finally flow to your knuckles once again. And remember, RVing is more than a hobby, it's a lifestyle!